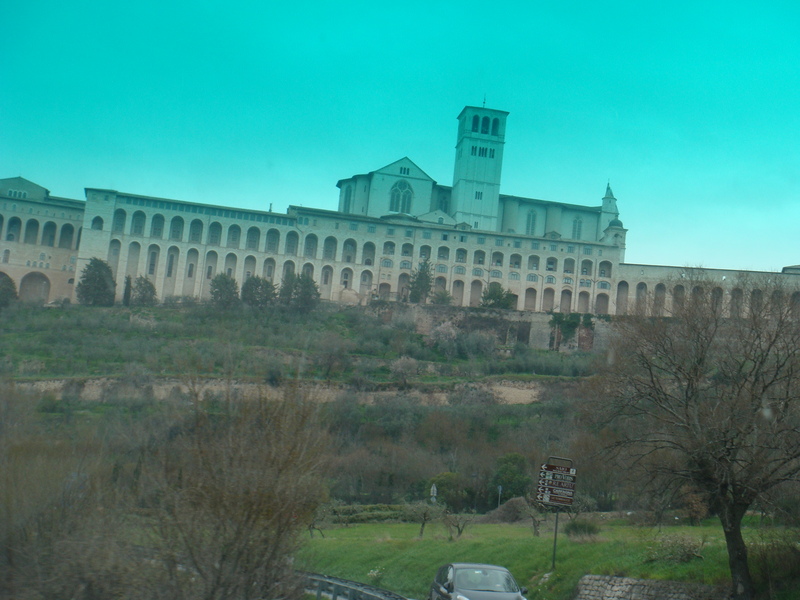 We left early yesterday morning to drive to Assisi, the home of Francis, one of the most admired of the Roman Catholic leaders. 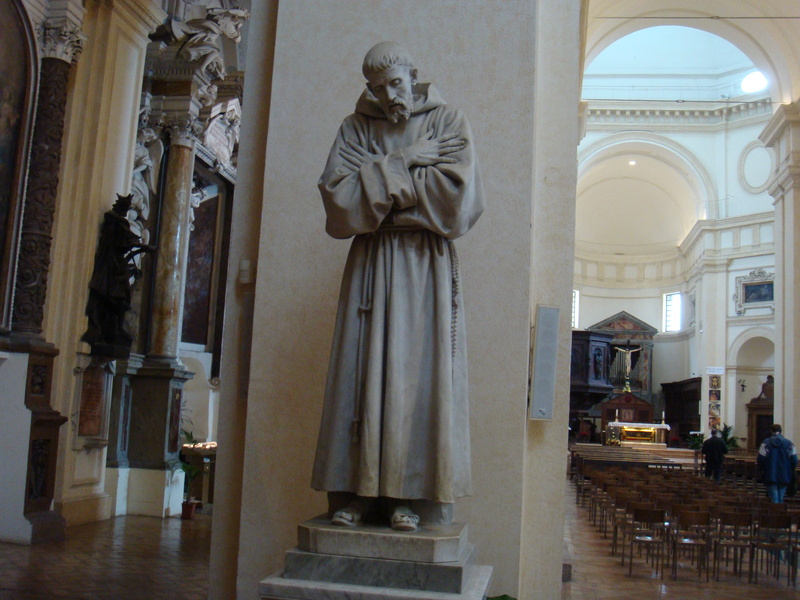 He was the founder of the Franciscan order. 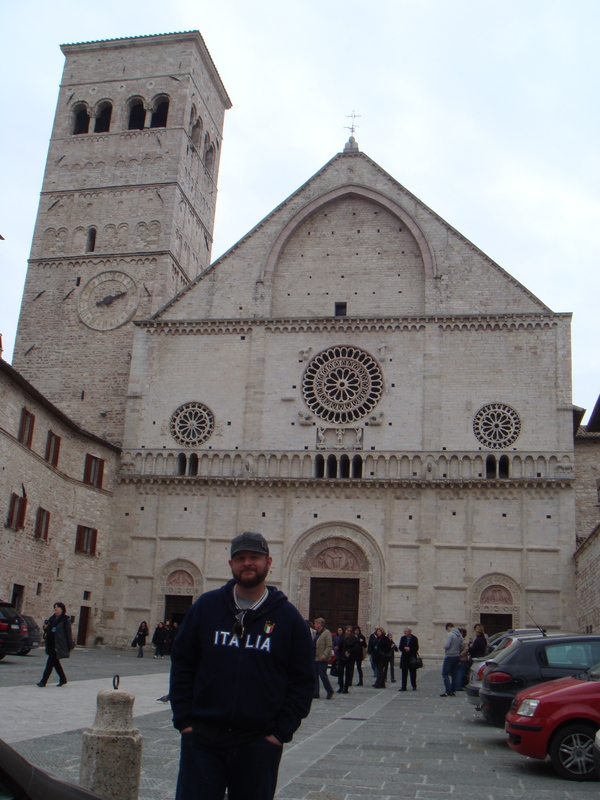 Assisi is about 3 hours from Rome, so we drove. The village is located on a high hill with walls. It is a quaint place and was really fun to see. Our first stop there was at the church building that was built in honor of St Clair, organizer of the female counterpart to the Franciscans. Her life was to help the poor, even as Francis sought to do. Our second stop was at a coffee shop. Coffee was great. We then walked through the town to the cathedral. It was an interesting experience. 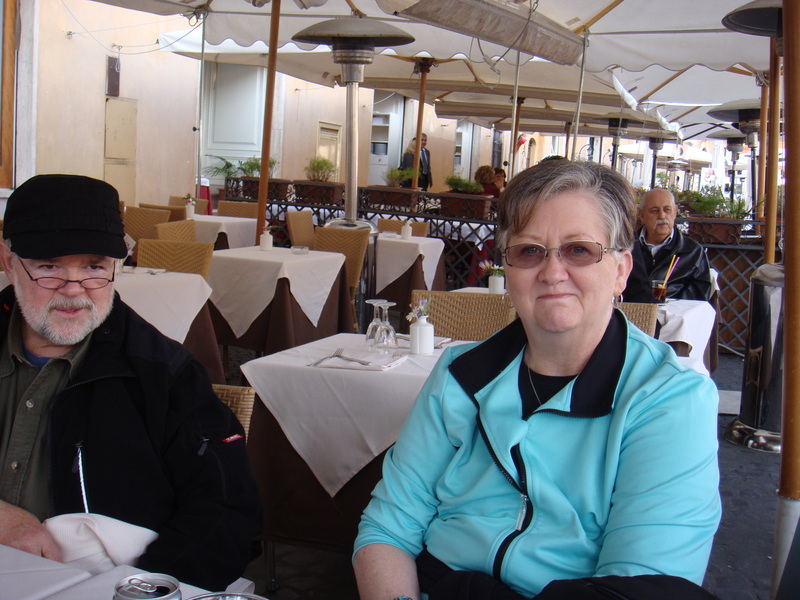 They have statues of Francis and Clair, and a beautiful room dedicated to Pope John Paul II. 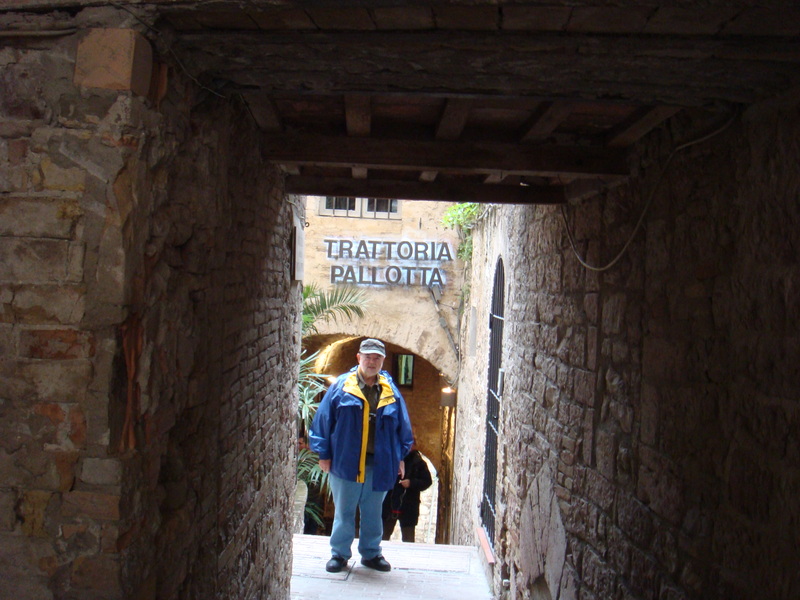 We made it to Trattoria Paitotta for lunch. Another great lunch. 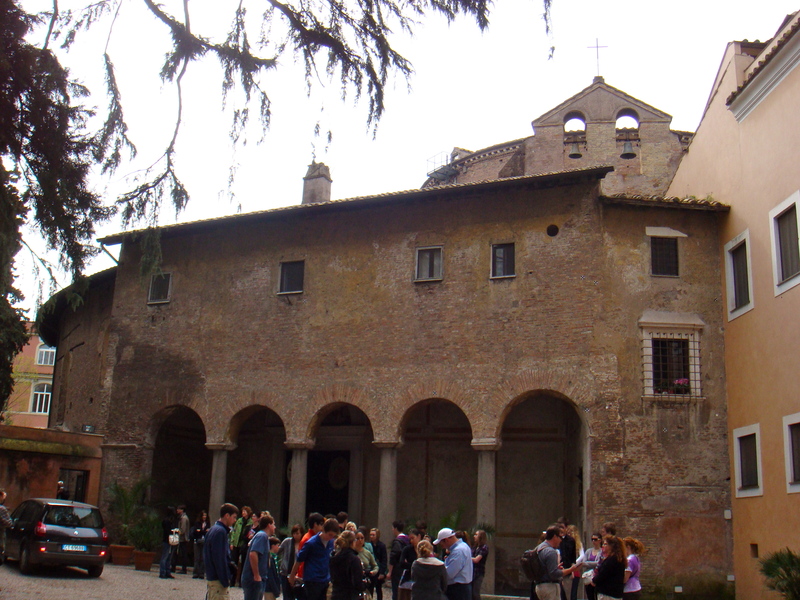 Following lunch, we walked through the town to the church building dedicated to St. Francis. In fact, there are two buildings as a part of the complex. 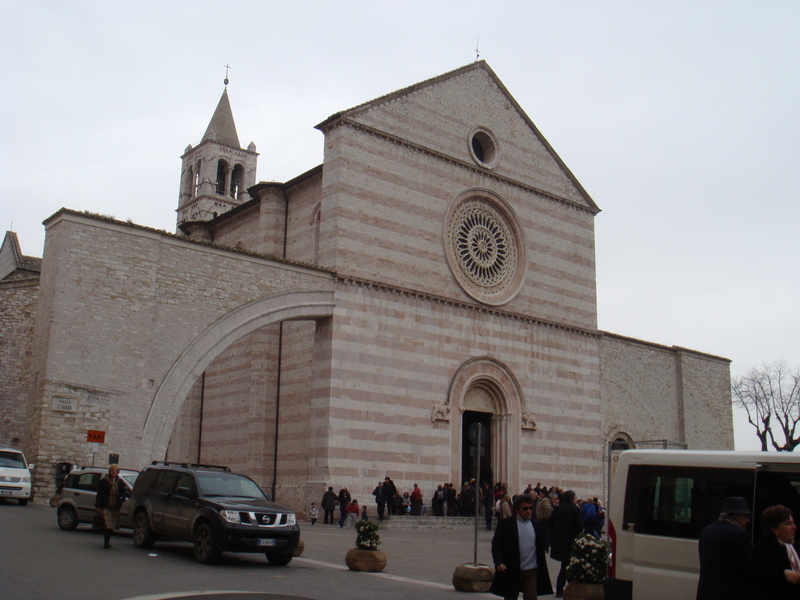 The first was built in the 12th century soon after Francis died. The second was built a few decades later on the top of the first. Both are beautiful, with the lower one being smaller and plainer than the upper one. 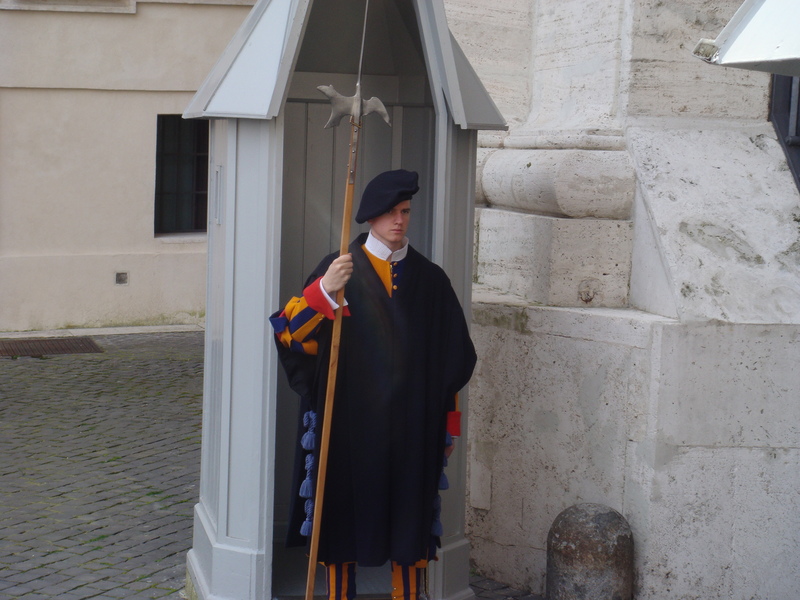 The thing that kept coming to my mind was that Francis would not have been pleased to see all the resources in the two buildings spent in that way in his honor. His focus was to help the needy. In fact he gave away his fortune to do so. I know the beauty and opulence are tributes to him, but I think if he had had a vote he would voted for no resources dedicated to his honor and all the resources used to help the needy. But what do I know? I’m just a redneck from Mississippi. 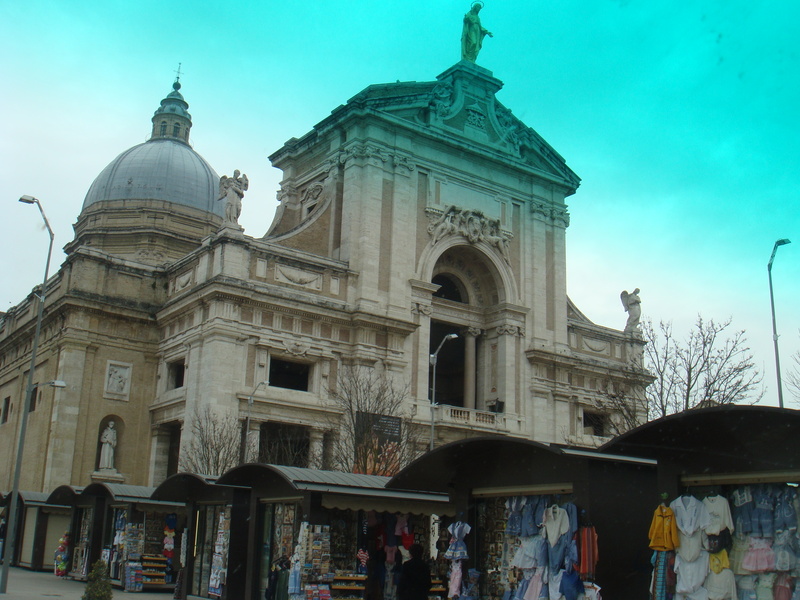 A church dedicated to Mary in a neighboring town. 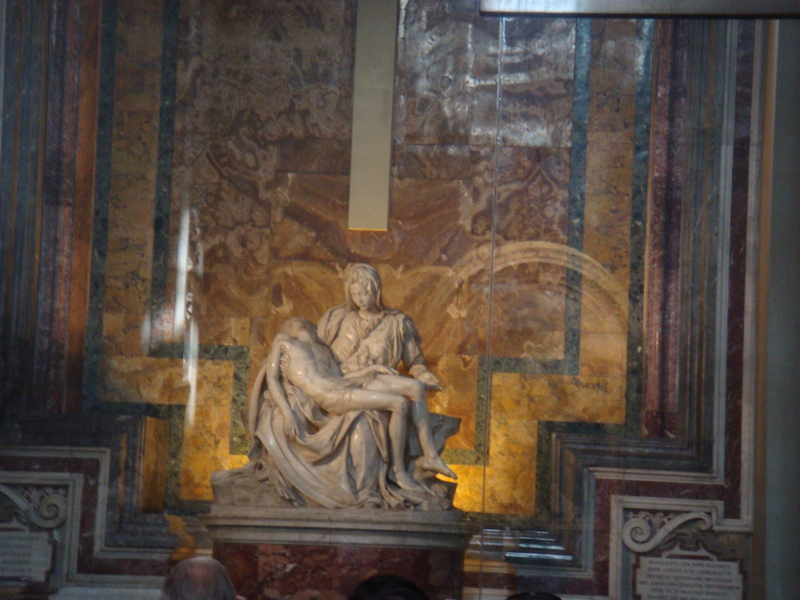 This is where Francis died. Evidence of a coffee shop visited. This is my decaf Americano. 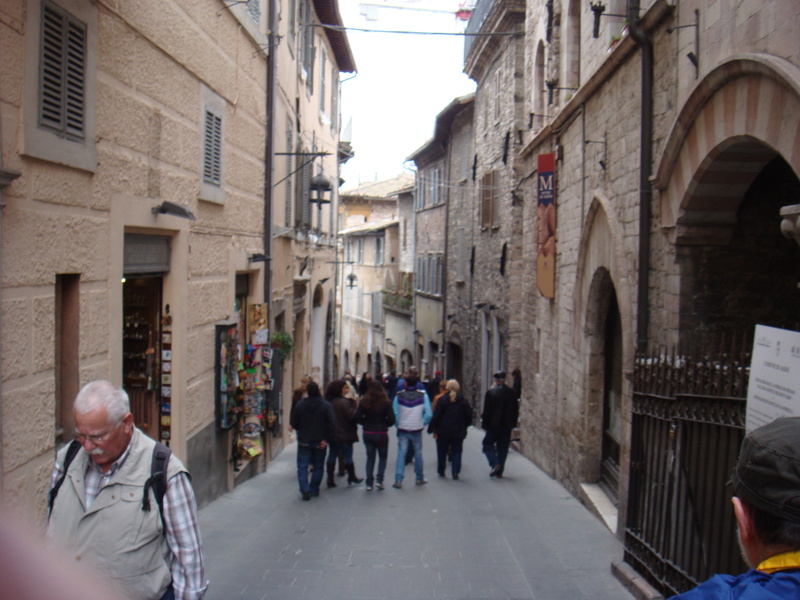 An Assisi street. With Clay on it. 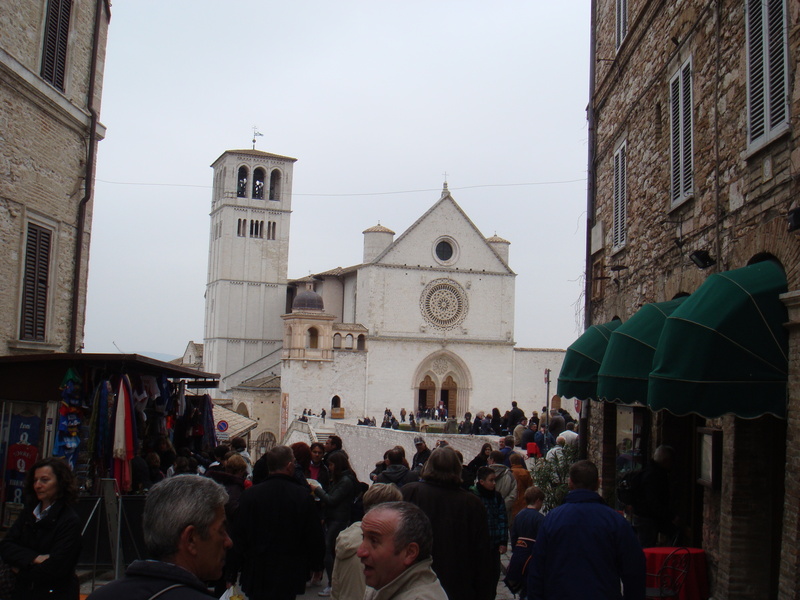 The upper church building dedicated to St Francis. We could not take pictures in the building. 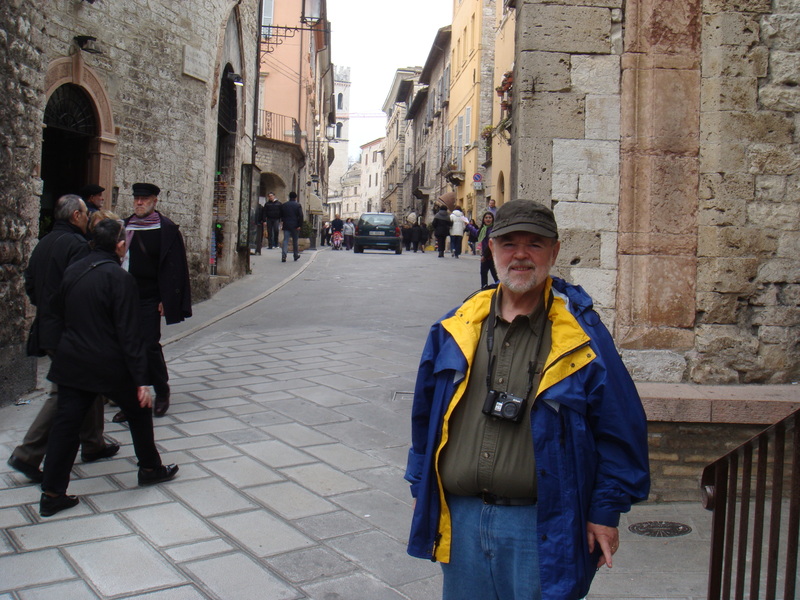 We left Assisi and drove back to Rome. At he hotel we ate another gourmet meal, then some of us went for a night walk to downtown again. We went to Campo di Fiore, Piazza Farnese, Piazza Navona, the Pantheon, Treve Fountain, and the Spanish Steps. Here are some shots. 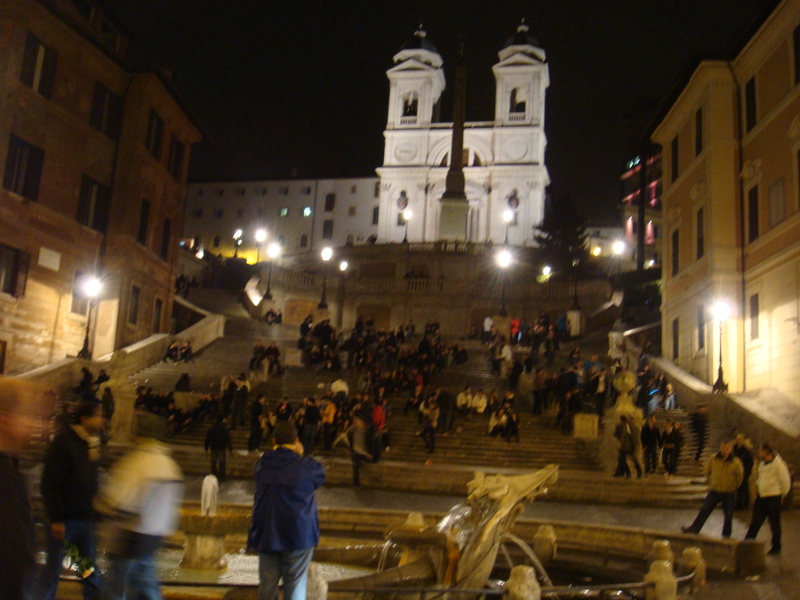 it was too dark to get one of the Pantheon and the Piazza Navona shot turned out blurry. Today we visited two museums. 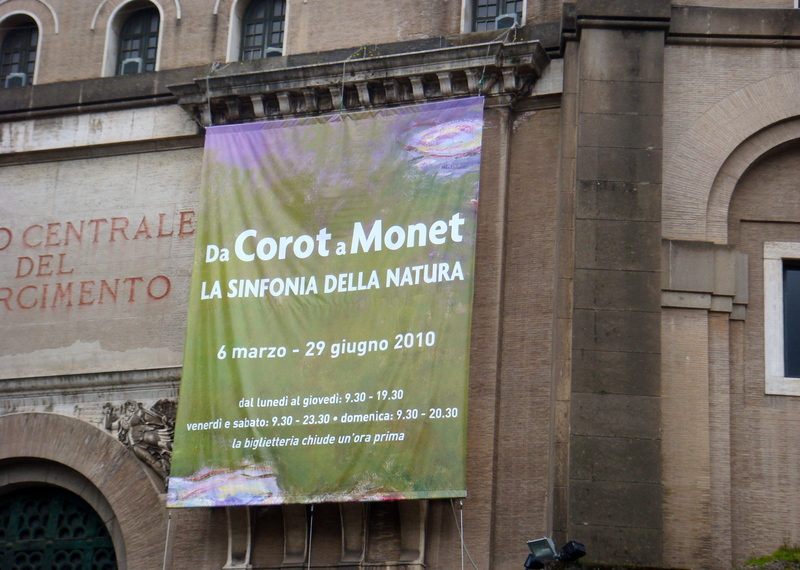 The first was to view an exhibit of Claude Monet and other impressionists contemporary with him. The paintings were outstanding. 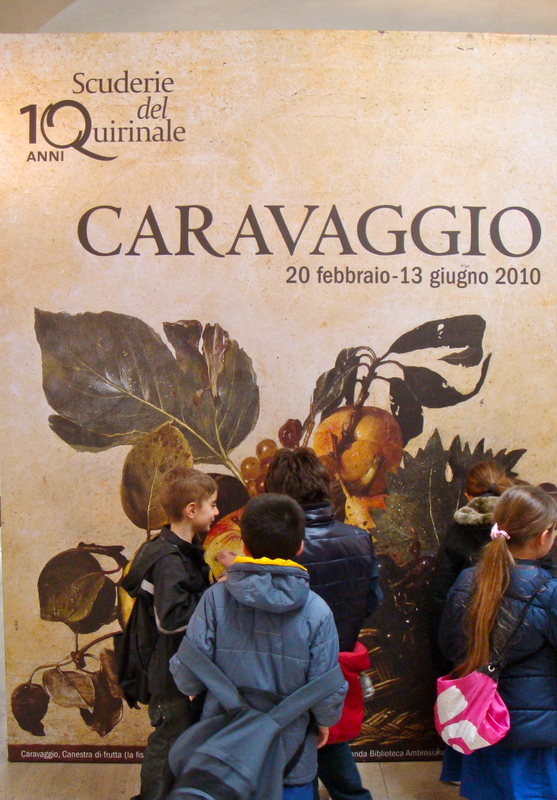 We then went to see a visiting exhibit of Caravaggio paintings. This was the best visit to a museum we had on the trip. 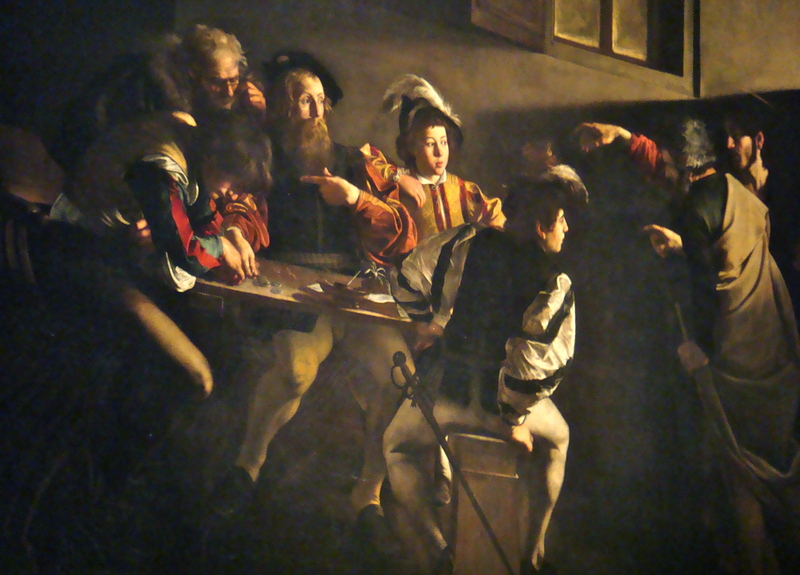 Caravaggio did not do many paintings, but his work was outstanding. I recommend him if you get a chance to see some of his work. In fact, when we finished at the museum where the exhibit was, we walked a little over a mile to see three more of his paintings in a church in the city. Of course, we were not able to take pictures in the museums, but I did get pictures of the buildings and of the three paintings in the church. The way they were hung and the crowd that was there to view them did not allow very good pictures, but here are the shots for what they are worth. Remember you can see the good pictures and the good writing on Jason’s and Clay’s blog. Matthew's calling. "You want me!? It has been a great trip. We are about to go and get the last gourmet meal here. Early tomorrow we start back. Pray for safety in travel for us. Blessings to you all. 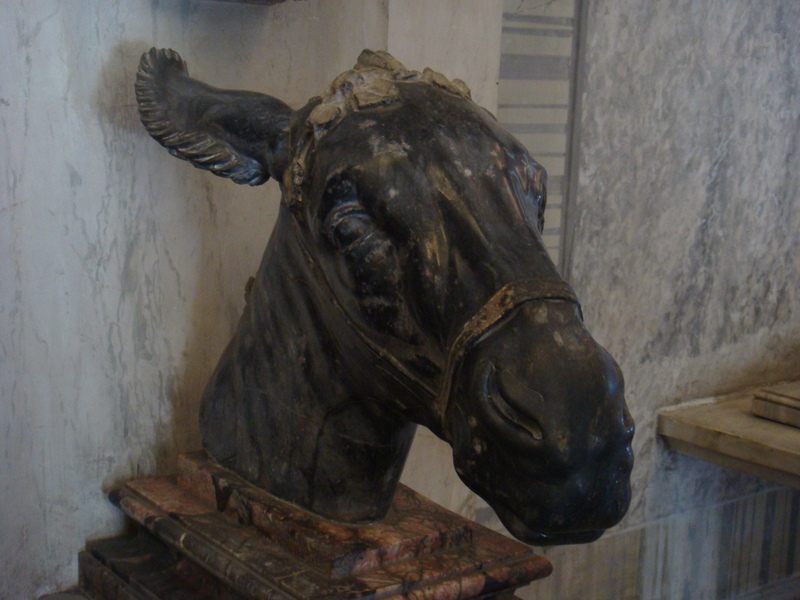 Our fourth day was spent riding around Rome and looking at churches and museums. It was a great day because we saw some of the most meaningful sites to me. 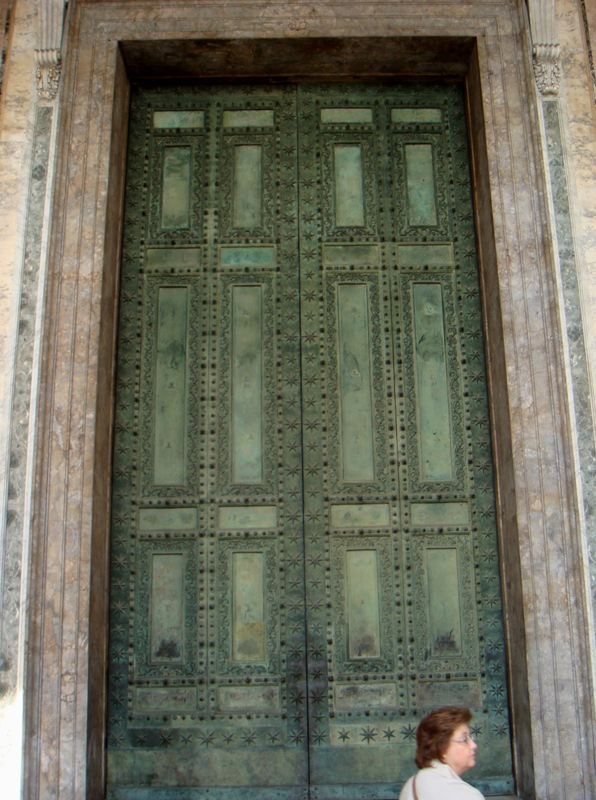 The first of these was the Church of Jesus, St. John the Baptist, and St. John the Evangelist. 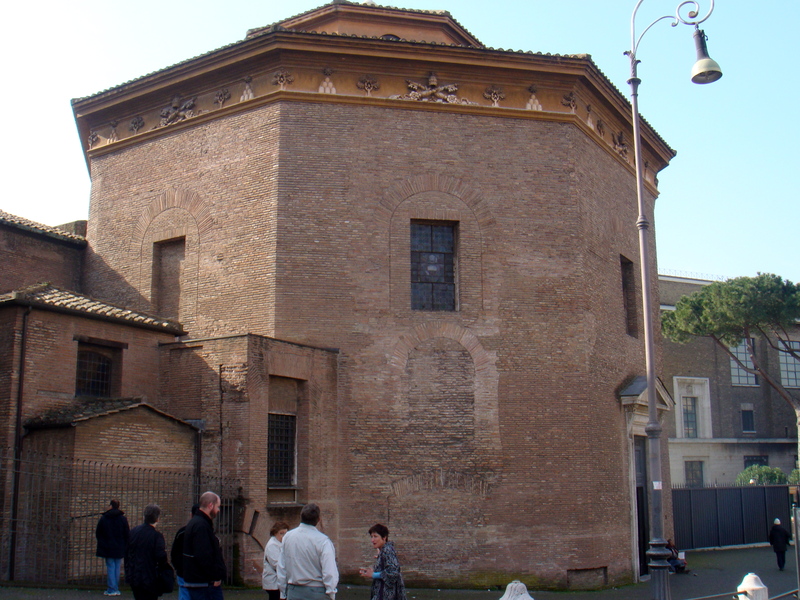 This church building was likely the first church building in Rome especially built for the purpose of the gathering of a church. Constantine established this church in the first half of the fourth century (a little after 325 a.d.). It was and remains the cathedral of Rome, meaning that it is the seat of the Bishop of Rome, who incidentally is the Pope. One of the significant things about this church is the adjacent baptistry. Can you believe a baptistry in a Catholic church? It is not a font, either. 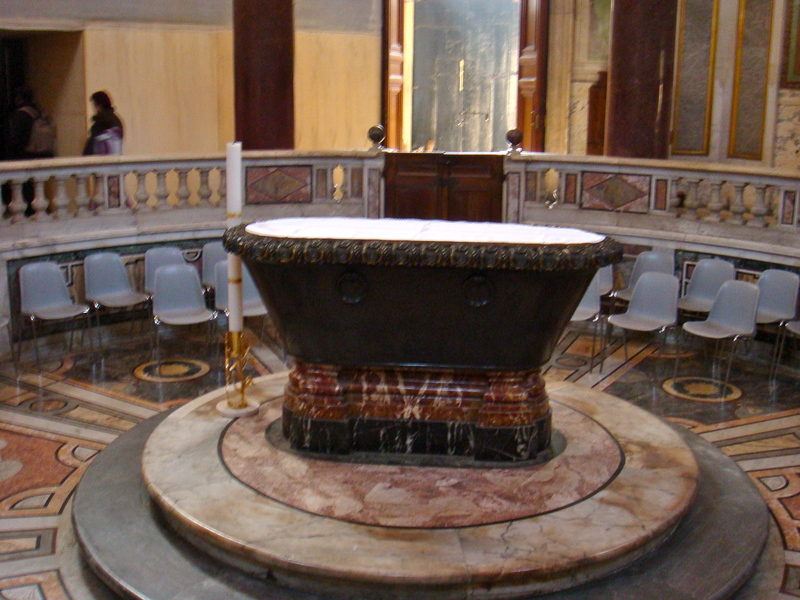 It is actually a tub in which people could be immersed, as was practiced in the early stages of the church. The baptistry is in a separate building. Look at some pictures of the church building and the baptistry. 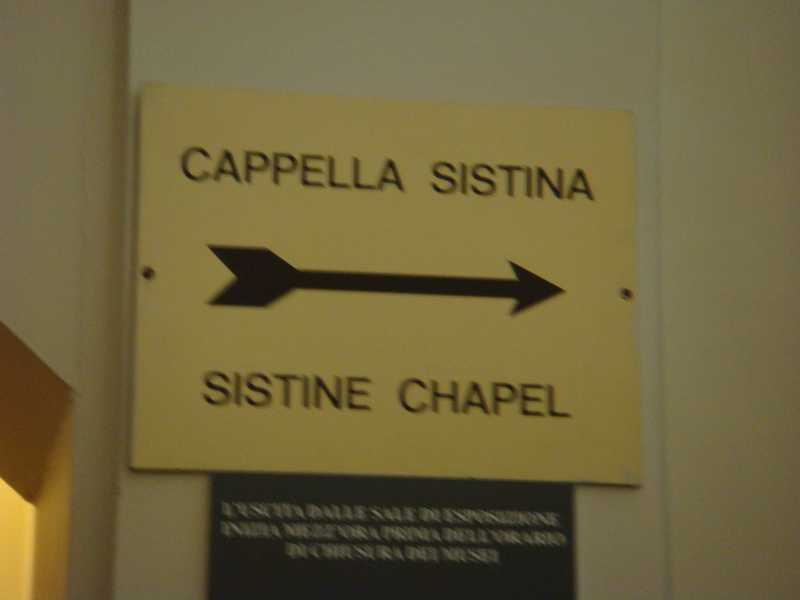 Our next stop was across the street at the Sancta Scala. These steps reputedly came from Pilate’s judgment hall in Jerusalem where Jesus was tried before him. The logistics of that seem difficult at best. 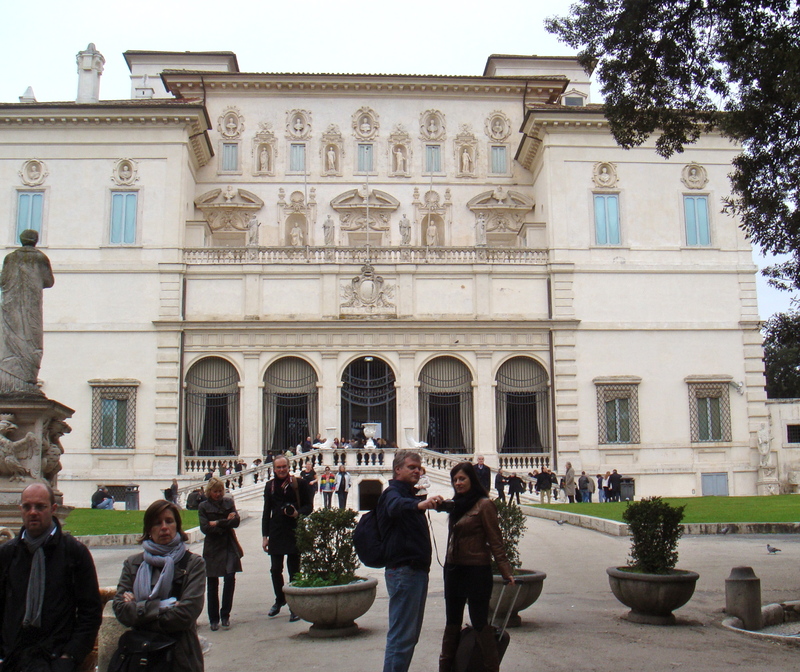 The steps were originally in the residence built for the Pope next to St. John’s, but were moved across the street. 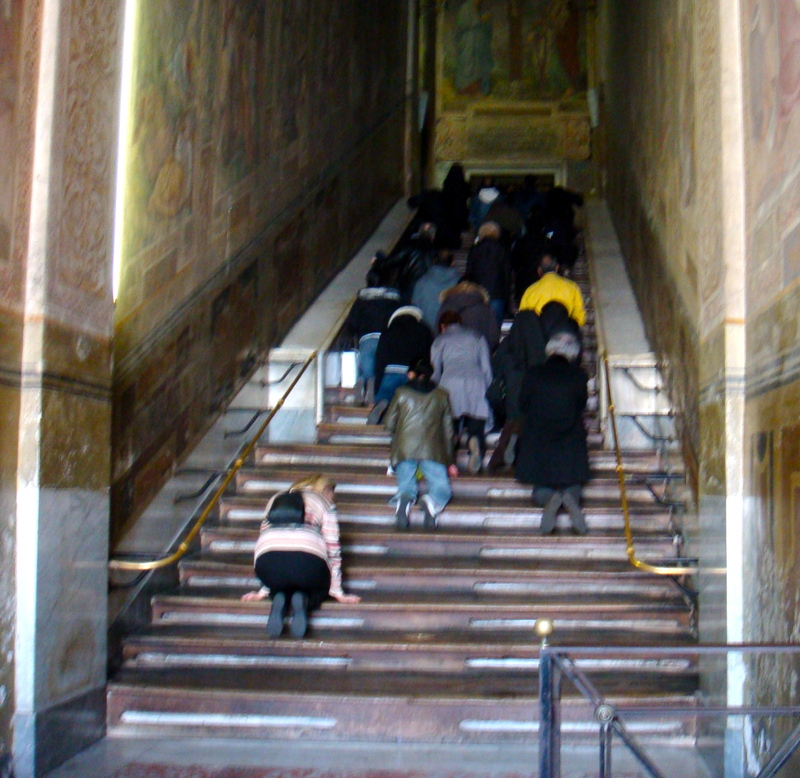 Signs indicate even now that one can only ascend these steps on the knees. On these steps, we do know Martin Luther was crawling up them in a ritual prayer exercise when the words from Romans, “The righteous shall live by faith,” kept resounding. He got up before he reached the top and returned to Wittenburg to write and post the 95 theses and the Reformation began. 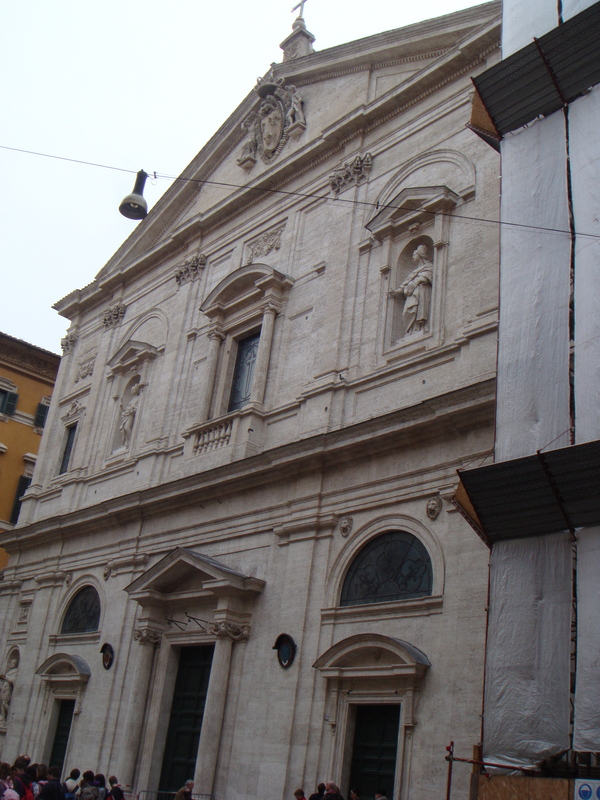 We then went to St Mary Major church building. This church was built in honor of the mother of Jesus after the Council at Ephesus in the fifth century and after the Catholic Church decided to honor Mary as “Mother of God.” That led to a several changes in doctrine in the church including the immaculate conception and the assumption of Mary. Our next stop was at a simple church building dedicated to St Stephen and several other martyrs. The building contains many gruesome paintings depicting the deaths of martyrs. 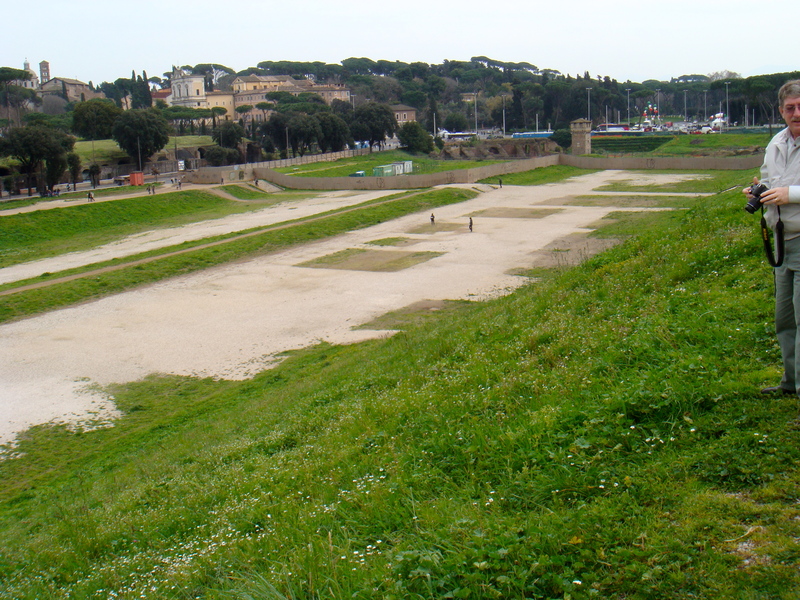 We then drove by the Circus Maximus, one of the sites of the free entertainment provided to the Roman populace by the emperors during the decline of the empire. The site takes to pictures to get it all in. 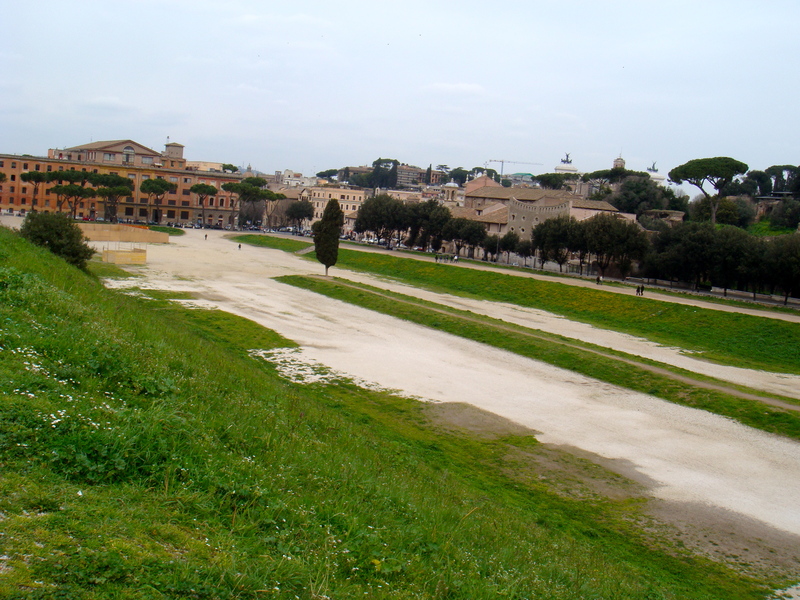 The length of the chariot racing track is about one mile. The circus was elaborate as were all the sites of that era. You can see where the seats were and the berm in the center of the track, but that is all that is left. The other end. You can see where the seats were along each side. We then drove up to Garibaldi Square. 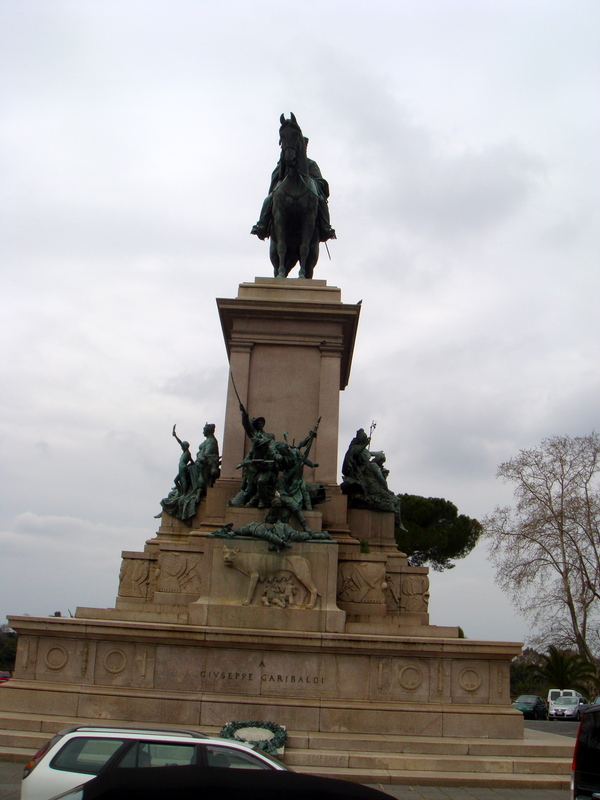 The site is named for Giuseppe Garibaldi, the leader in the unification of Italy as a nation that was not completed until the early 20th century. Garibaldi was one of my heroes as a child because of his persistence and his ability to lead people to serve even to the point of sacrifice. We drove next to the Borghese Park for lunch at a kiosk owned by a man named Amir whose friendship has been cultivated by some of our people who have traveled here. We had a super lunch consisting of a sampler platter of Italian food. It was really good. Amir also provides transportation. 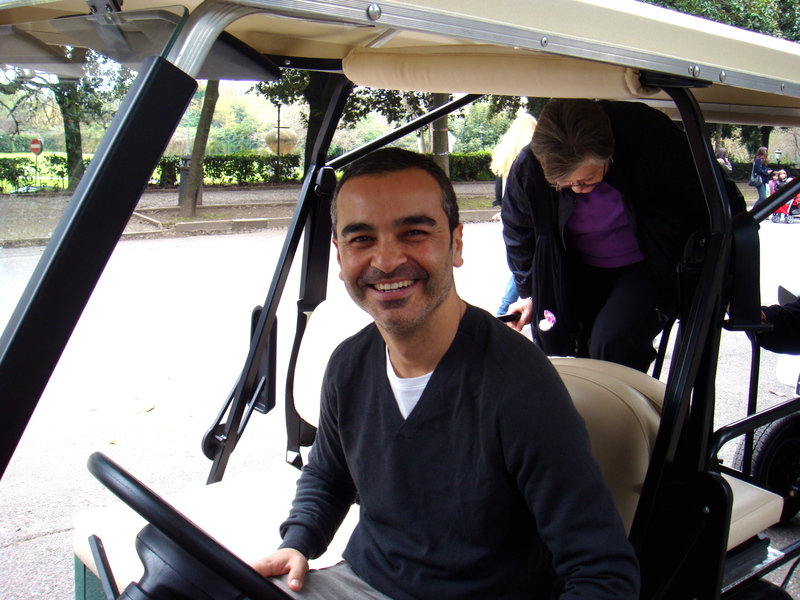 One of his men drove us around the city, and he and two of his men provided transportation as a favor to us, taking us from the kiosk in the park to the Borghese Gallery in his golf carts. 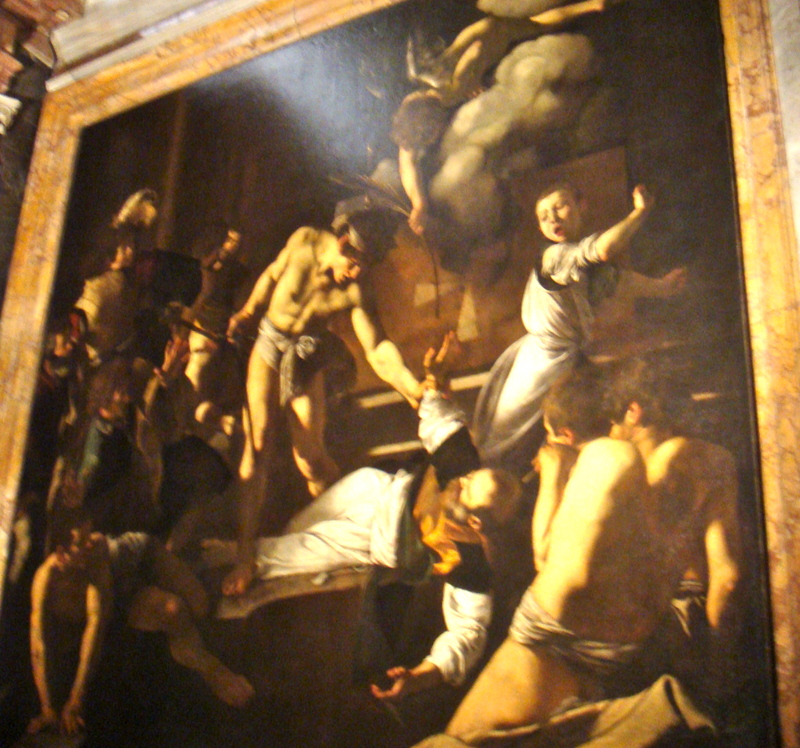 There we saw some outstanding paintings and sculptures by Caravaggio and Bruninni. It was time for coffee. 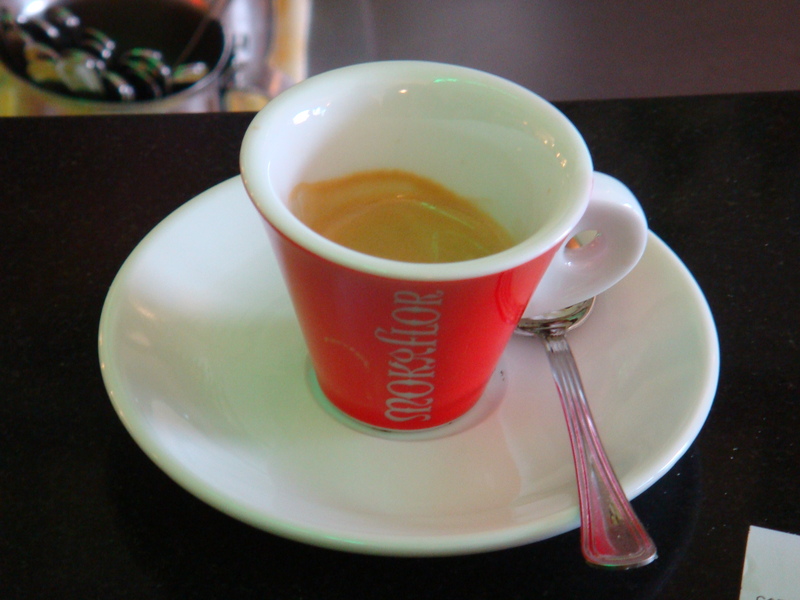 We went to a very good coffee bar on the Via Venedeto where we had some super coffee served by an entertaining barista. You can see the barista around the customer. 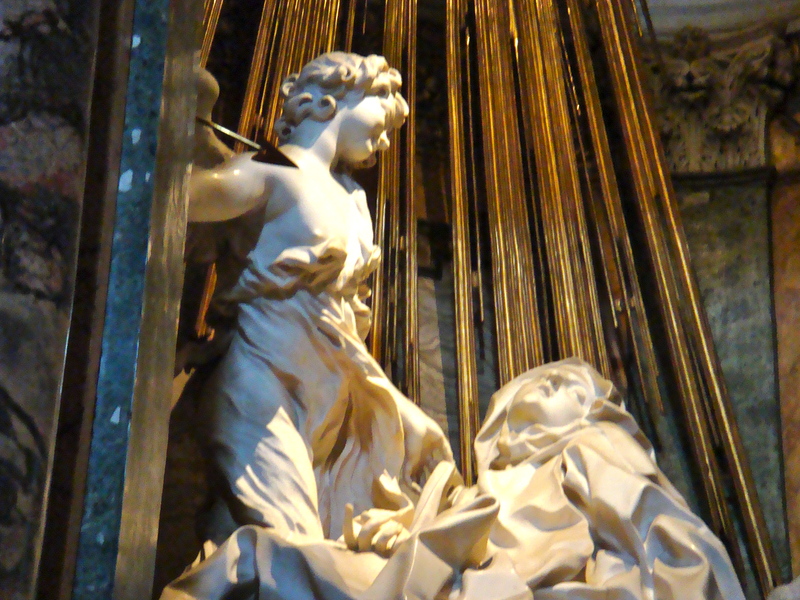 Our final stop for the day was at another church building to see a sculpture of St Theresa in Ectasy by Brunini. 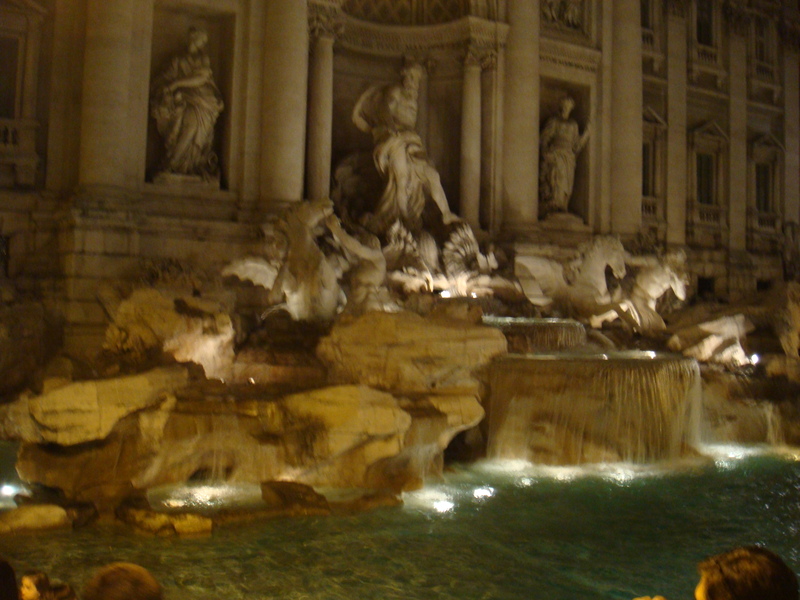 We then headed back to the hotel on the underground, home to the infamous Rome pickpockets. Unfortunately, in spite of all my diligence to watch out for them, I encountered one and really made his or her day. He or she got my wallet with my credit cards, my driver’s license, my social security card, and more cash than I want to think about. Oh, well. It’s only money, and thanks to American Express, the cards are taken care of. In spite of the encounter, we still had a good day. It ended with a visit to a great gelateria where we had another gelato and then went back to the hotel for some work and another great gourmet meal by Chef Faris. 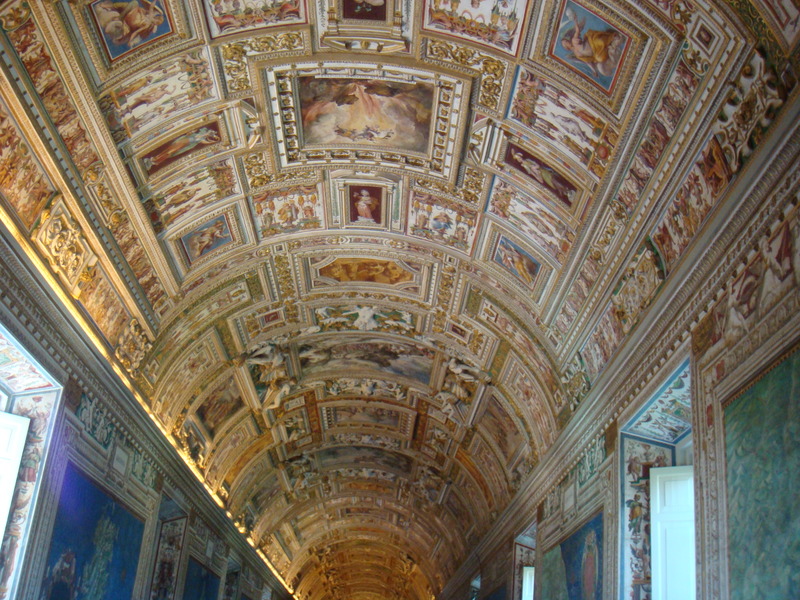 The name “vatican” comes from the location of the headquarters of the Roman Catholic Church. 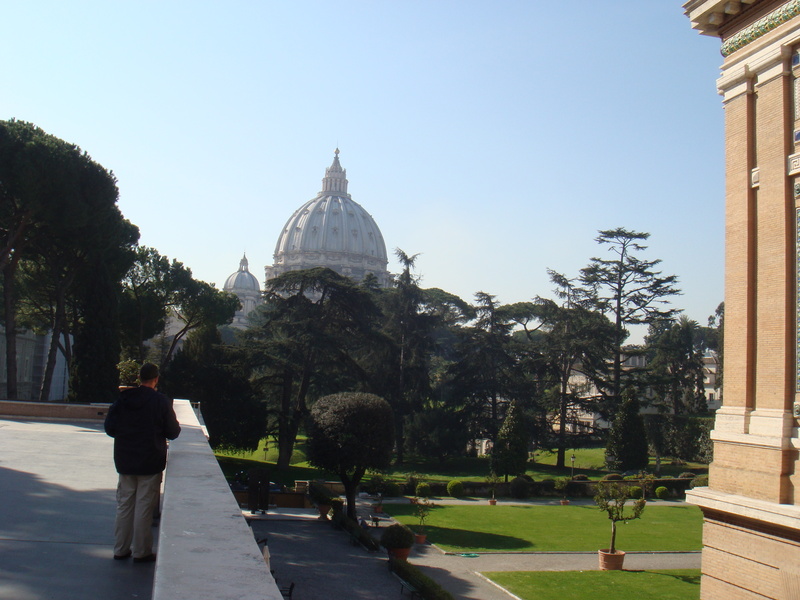 It is the residence of the pope and the center of business for the church. It is also a big center of worship, focused on St. Peter’s basilica, and the storehouse of inestimable treasures belonging to the church. 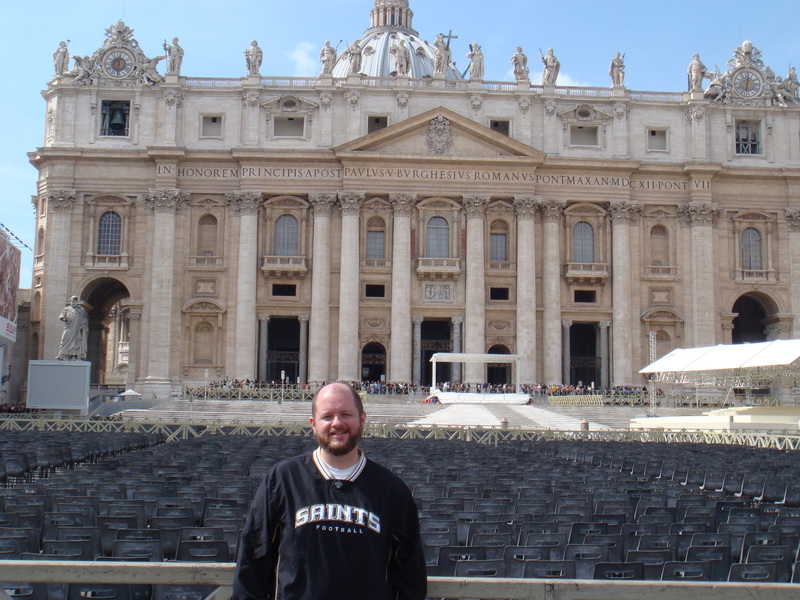 Interestingly, St. Peter’s is not the cathedral (seat) of the pope, who is the Bishop of Rome. 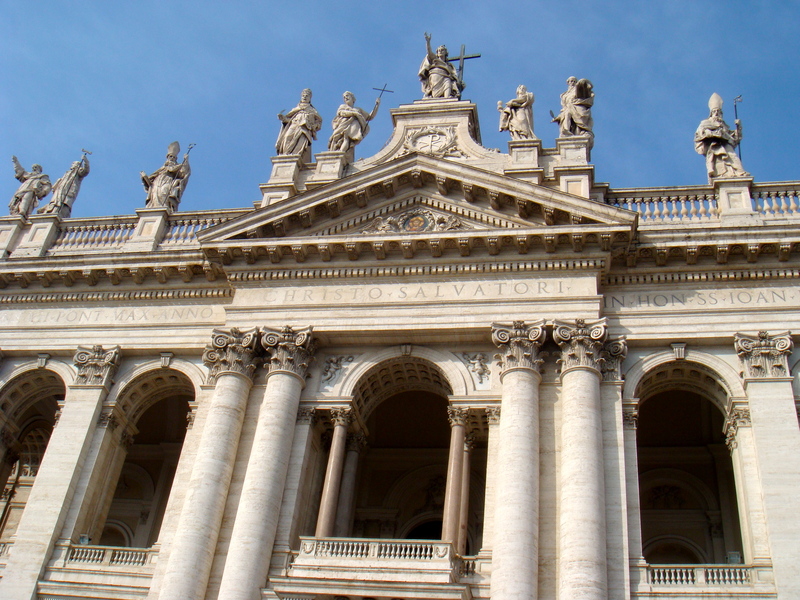 St. John’s is the cathedral of Rome. 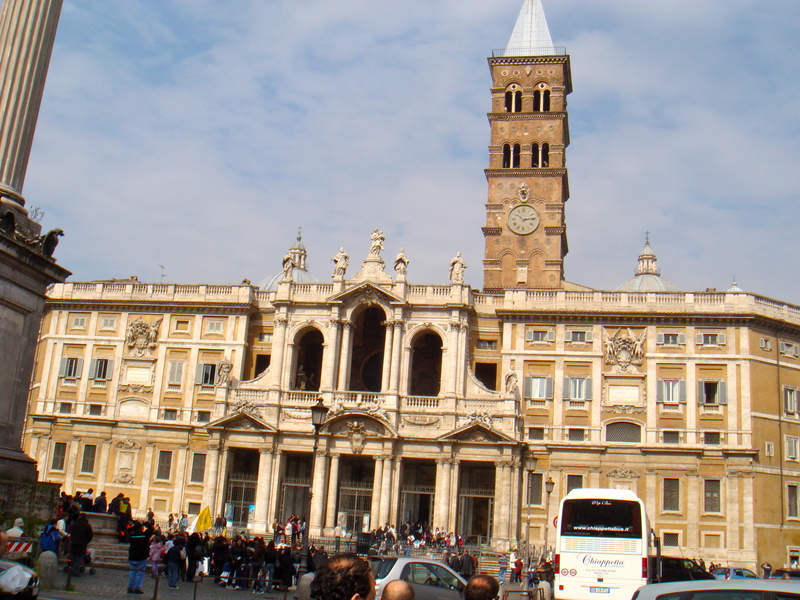 St. Peters is related to all the Catholic church. Another interesting note that I finally got straightened out in my mind. 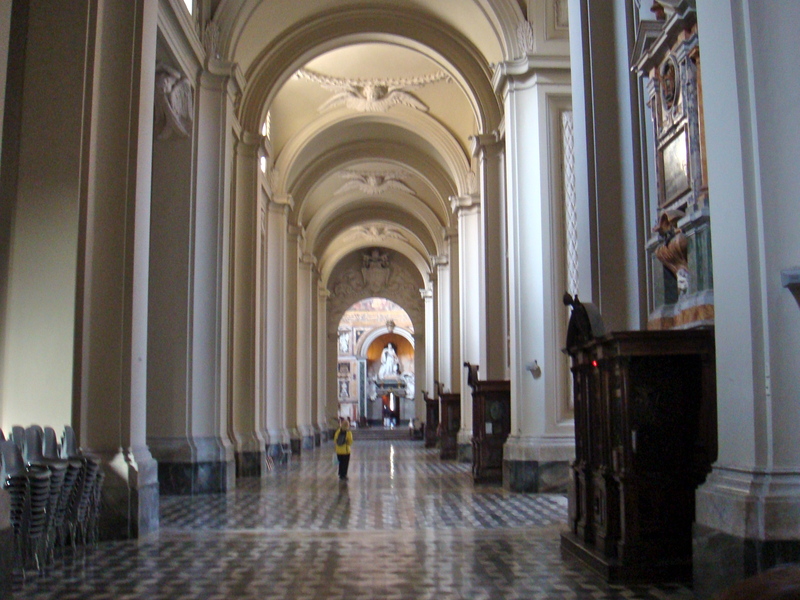 While a cathedral is the seat of the bishop, a basilica is a kind of building. It is an architect’s term describing a building with rows of columns down the sides. (For you architects, I know it involves more than that, but I am giving the redneck version here). 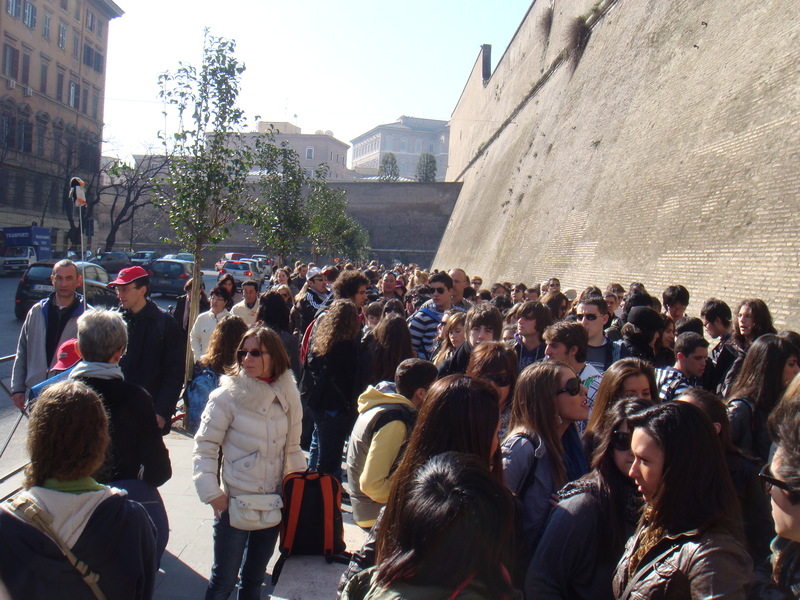 When we got to the Vatican, there were literally thousands of people standing in line to enter. Thanks to Clay’s foresight, we had reservations and were able to get in quickly. 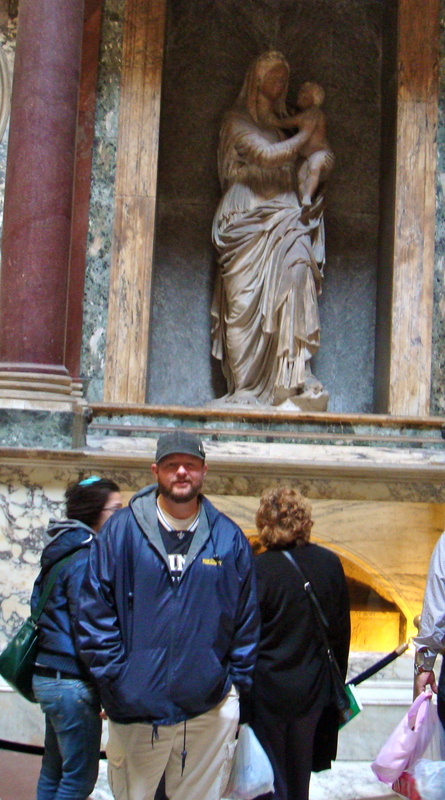 As usual, we saw many art treasures, some beautiful gardens, an apartment decorated by Raphael, the Sistine Chapel, St. Peter’s, and St. Peter’s Square. See the pictures below, and remember you can see more at Jason’s and Clay’s blogs by clicking on the blue. 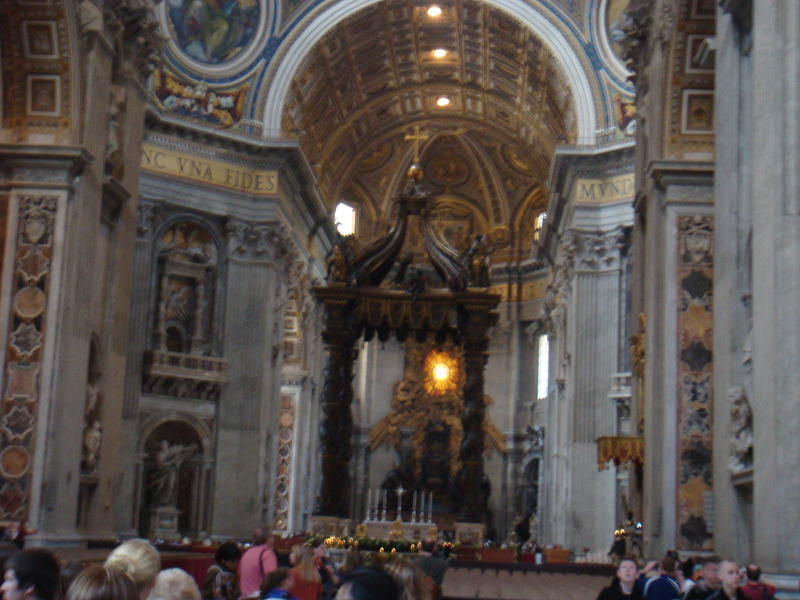 A partial picture of the massiveness of St. Peter's. 400 feet long. St. Peter's. 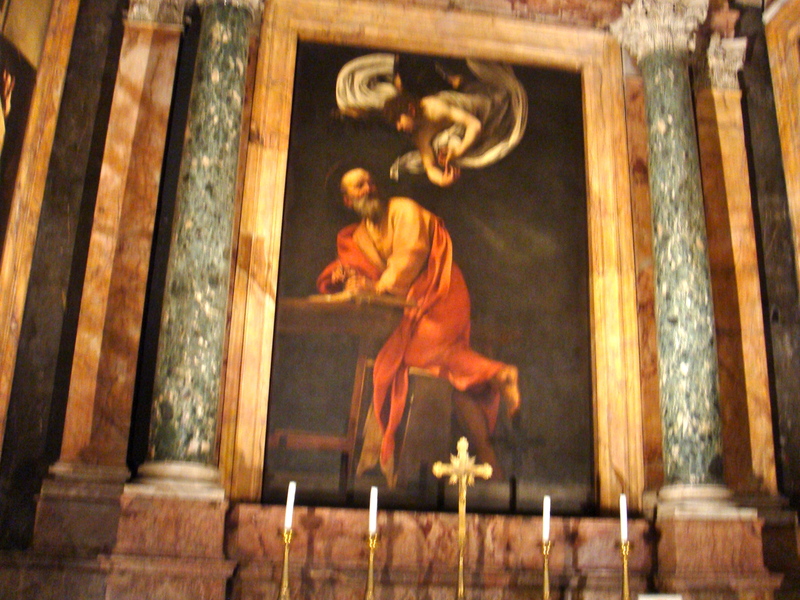 One of the saints standing in front of it. 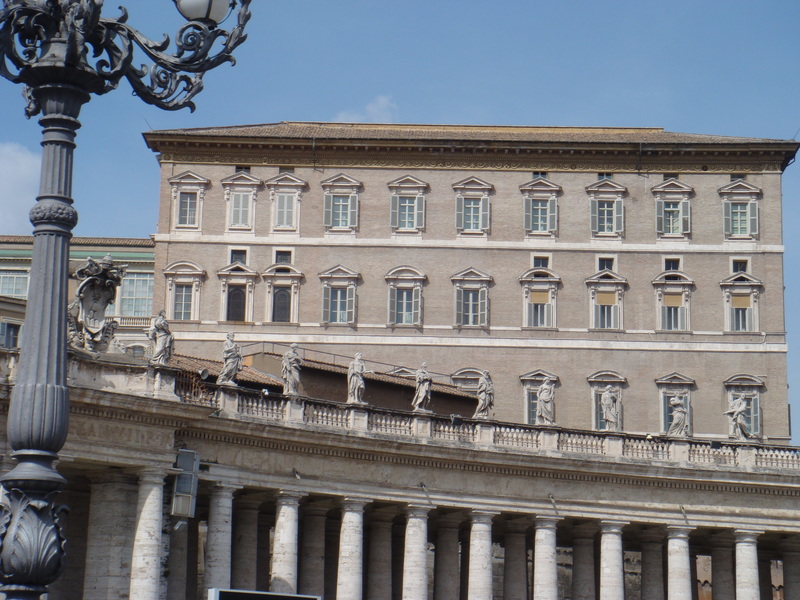 The Pope's apartment. One of these windows is where he speaks to the people. 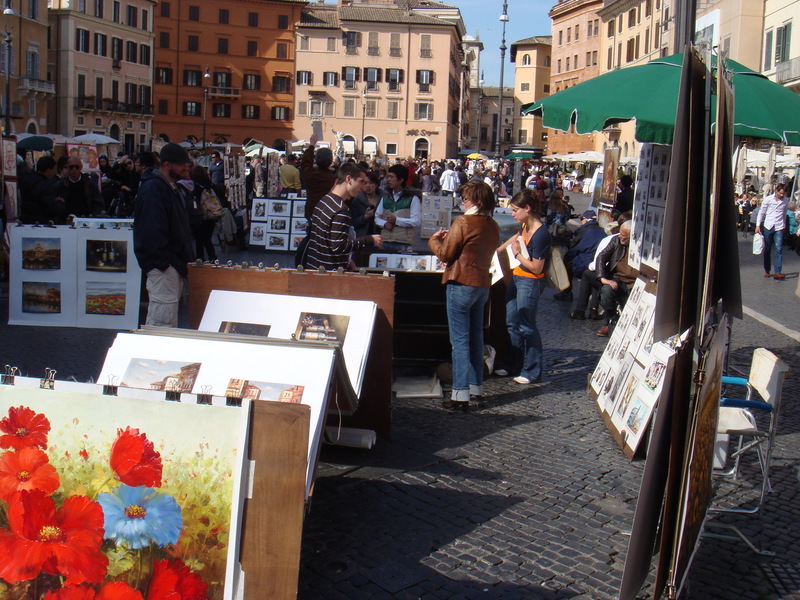 When we left the Vatican, we headed for Piazza Navona, one of our favorite spots in the city. 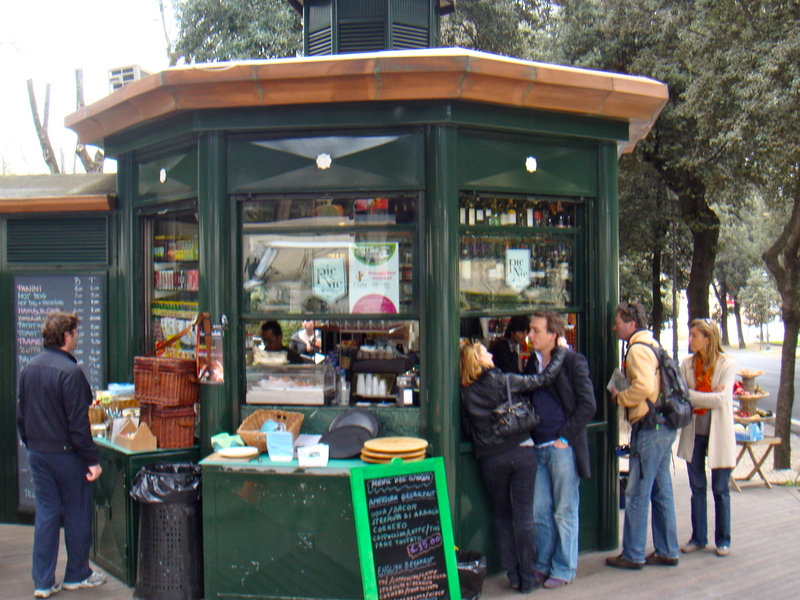 It is a square where people gather and artists work, and marketeers market. There is also an impressive and famous fountain in the square. It was used in the movie Angels and Demons. 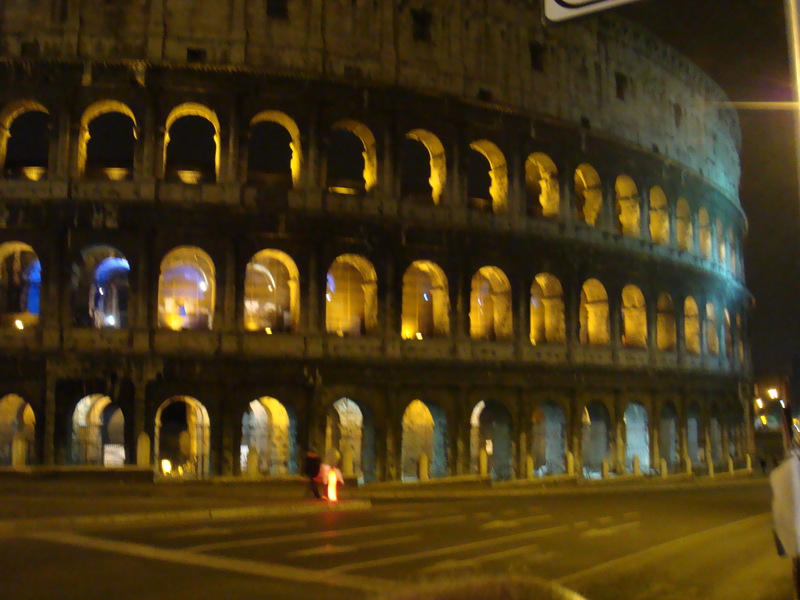 Our main interest in the square is that it has a plethora of great Roman restaurants. We ate a delicious lunch there. 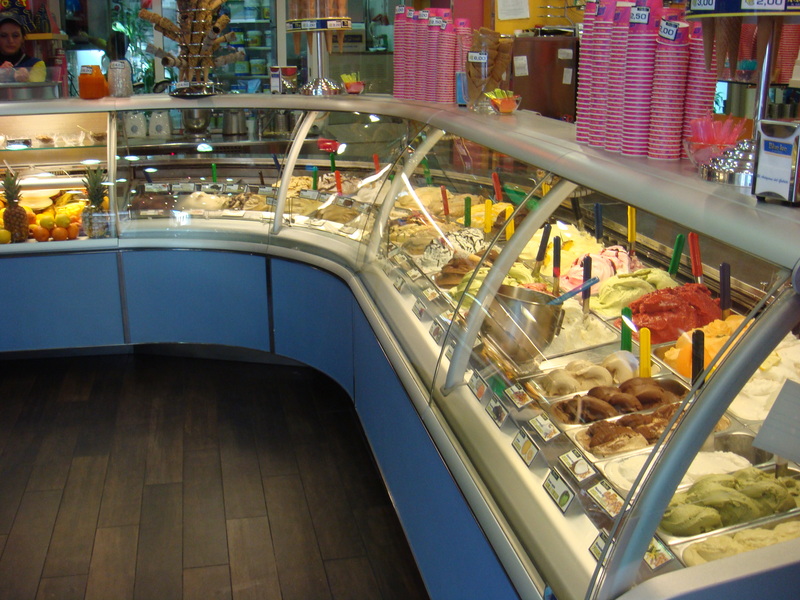 Our next stop was at one of the hundreds of gelato shops in the city. This one was one of the best. Gelato is even better than Blue Bell. I know that is hard to believe, but you have to try it. After a gelato, we walked on to the Pantheon. This site was once a shrine to many gods the Romans worshipped. After Constantine, it eventually became a church. It is a phenomenal building. Raphael (and many other well known Romans are buried there. Our next stop, of course, was at one of our favorite coffee bars. 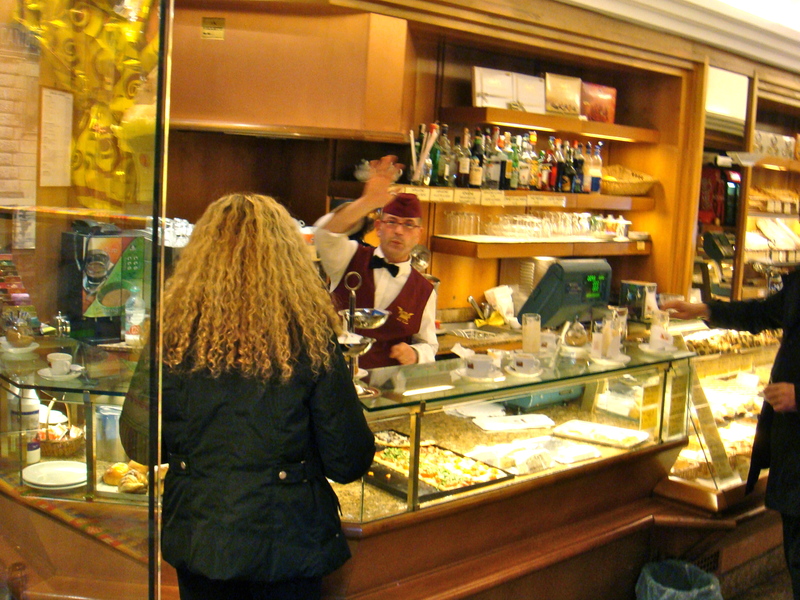 There are very few seats or tables in Roman coffee bars. This one has no tables at all and only a very few benches. The Romans walk in, pay for the coffee, go to the bar and order it, stand there and drink it quickly, and leave. Great experience. Wonderful coffee. They do not put too much water in their coffee like most Americans do. We then rode a bus back near our hotel, studied Phillipians, ate another gourmet supper, worked a little, and went to bed. Tomorrow, Carla, our guide, joins us. 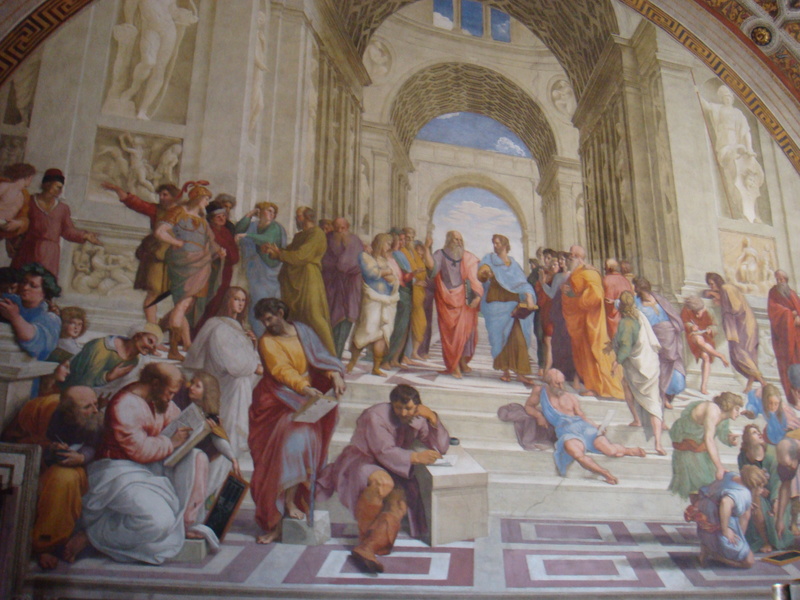 We will walk around Rome looking at the Forum, the square Michelangelo designed, and some other significant sites. If you want to see posts before this one, please visit my old blog by CLICKING HERE.